With village festival fireworks happening around Malta from June–September, here's what you need to know about your safety. Malta is staunchly Catholic, so religion plays a major part in daily life, but that doesn’t mean the Maltese are conservative – actually, it's quite the opposite. 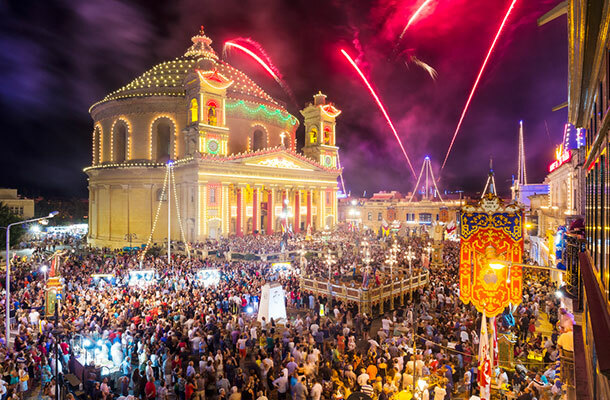 From June to September every village in Malta holds a festa, a daytime religious commemoration of the parish patron saint, followed by celebrations into the evening with marching bands, food, beer and fireworks. The Maltese are very proud of their fireworks, and have turned the pyrotechnical displays into art. On a local level, the villages compete with one another to put on the best display. There are fireworks factories all over the islands. Some villages make their own fireworks in ad hoc factories. Sadly, there have been a few horrible accidents. In September 2010 five members of the same family died after their Gozo factory was destroyed in a massive explosion. Malta’s lack of bureaucratic red tape and shunning of over-regulation is one of its charms, but as a British ex-pat’ said online after the Gozo blast, “The Maltese attitude to the manufacture, storage and handling of fireworks is suicidal.” He said he’d seen locals setting up a large display during the day, just 10ft (3m) from a busy shopping street. What the locals refer to as petards, are the loud bangs you will hear during the day – and these are not to be mistaken for a factory explosion. Petards are fireworks that make no visible display aside from a puff of smoke, but let off a loud booming sound. Many people want them banned, as these are pointless and annoying. But, supporters say they’re part of tradition. If you think you hear gunfire rather than an explosion, your mind isn’t playing tricks on you. Bird hunting is extremely popular in Malta. Hunters set up hides along cliff tops and in open fields to take shots at wildlife. Given the main island is only 18mi (30km) long, the density of hunters is pretty high. If you go to one of the smaller village displays, keep your distance. Fireworks can be a danger to those handling them and to spectators. Shells may misfire and head off in the wrong direction, and burning remnants often fall on spectators. If you are burned, pour cold water over the wound, a continuous flow is best. Taking the heat out of the injury limits the damage. Seek medical attention as soon as possible. Fortunately Malta has an excellent hospital and medical system, but you will need travel insurance to pay the bills. Resist the temptation to buy some fireworks and have your own impromptu display. Setting yourself on fire puts a real dampener on the night. Setting fire to someone’s house with a misdirected skyrocket will leave you facing a big liability claim. Your travel insurer is going to take a long hard look at those claims, and any evidence you were drinking or skylarking at the time will leave you high and dry. Malta, especially the main island, has a reputation for bad roads and terrible driving. They’re only half joking when they say: “we neither drive on the left nor the right, we drive in the shade!”. Travel Tips: What's the go with H2O in Malta? Water is a problem in Malta, either not enough, or too much. The tiny islands don’t have rivers, so tap water is desalinated seawater and groundwater, of dubious quality. Traveling his ancestral home in search of connection, Shaun Busuttil finds himself stuck between two cultures – Maltese and Australian.